At least Australia had a player winning slams in recent memory, as well as the rich tradition of many great players over several decades. In “The Tennis Book,” which looks like it was published in 2009, the entry for Canada finishes with “For the present it is better known as Britain’s Greg Rusedski’s country of origin.” How cruel can you be? Still there’s something to be said for experiencing your nation’s best period right now, and not having to cling to faded glories. As Roger Rasheed would say, it’s all upside. In fact he’d fashion it into a motivational hashtag. It’s great that Australia has all these past greats, and they’re all generous with their time, but it can grow wearying when they’re wheeled out at every event to remind us how things used to be. Still, the Swedes have it worse. Now there’s a tennis nation that’s fallen on hard times. One area Australia is still fortunate in is the number of tourneys you have, including of course, a Slam. You must be enjoying having the tournaments in you own time zone for a change! And yes, it is truly sad about Sweden. As an Edberg fan I miss those days and feel badly for a former great tennis nation. Having tennis on during the day, on my actual television, is absolutely the best part of January. Every moment is to be savoured. I actually got to meet Laver briefly last month. Just a few words, but he was lovely, and generous with his time to everyone. A challenging and fun way for you to start the new year, isn’t it, Jesse? An elegant and stylish post on that “dream final” that the Brisbane organisers, the official broadcaster and local ticket holders actually got. Personally have no doubt whatsover you’ll be taking up that challenge, as always, with great elegance and style. A very enjoyable 2014 to you and your loved ones, Jesse! I wish I’d had time to write about that final. For only three sets, it certainly had enough turns to be interesting. It was a strange one, but great for Hewitt. I honestly didn’t see him winning another title (after the Newport disaster last year), especially against Federer. If only a few more hardcourts played like Brisbane’s. Unfortunately it also came on the same day as Australia completing a 5-0 series demolition of England in the cricket. Australian sporting pride is nearly insufferable even when we’re losing. That day it was unbearable. Not easy to pinpoint the true official start of the professional tennis season…and sugar overload doesn’t assist clarity of mind. I have been feeling uncertain for many days and matches… Now, with an early January post at the Next Point, I doubt no longer… The New Tennis Year has begun and Your Lleyton has shaken his rust for the occasion. Long live brilliant tennis anno 2014! And long live its talented scribe! Thanks, Eva. I’m off to AO qualifying today, so hopefully I’ve have something resembling a new post up sometime soon after that. And Our Lleyton… That was a shock, especially given he’d had to recover from that match against Nishikori played in nearly inhuman conditions. 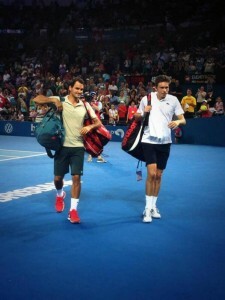 All the more impressive that he seemed so fresh, while Federer’s legs looked leaden. Regarding cricket, perhaps the Australian tourneys could take note of Chennai. There they had the winner of each match hit tennis balls into the stands with a cricket bat, much to the delight of the fans. Some tennis players were definitely more skilled at this than others!